I was fully intending on finishing off my K-TAI post. Really. *takes a deep breath* I am trying very hard to keep this post coherent. It is proving to be very difficult though. I admit, I started watching MSLN purely because of Mizuki Nana. Part of the reason I became a NanoFate fan was because of her too (because, as we all know, she’s an avid supporter of NanoFate). But somewhere along the way, I completely fell in love with the series on its own. 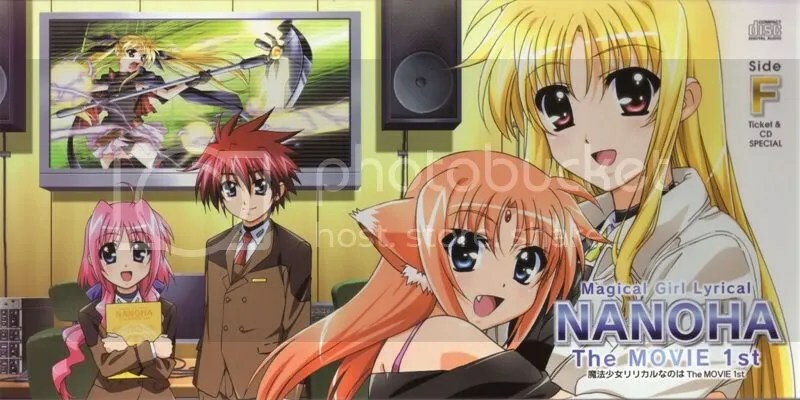 And this drama CD here Magical Girl Lyrical NANOHA THE MOVIE 1st Drama CD -Side F- reminds me of all the reasons why. And I guess I’ll take some time to fangirl over Nana-san’s awesome voice acting skills. This is a drama CD. No visuals whatsoever. Yet I can hear clearly when Fate is being hesitant, embarassed, disappointed, gentle, etc..
Also, there is the song. I am looping it continuously. I always like it when Nana-san sings slow/ballad-type songs. While 君がくれた奇跡 (The Miracle You Gave Me) isn’t on the same epic level as Innocent Starter or ETERNAL BLAZE, it’s definitely my favourite MSLN song from her so far. The lyrics are another thing to fangirl about. Fate is singing about Nanoha here in this song. And I start grinning to myself everytime Fate sings I want to tell you, “I love you”.